The third pattern that I was able to release at Knit Nation is Kōhō. This vest top incorporates details inspired by Japanese fashion with a completely new and unusual construction. A couple of months ago I was fortunate enough to visit the recent Yohji Yamamoto exhibit at the Victoria and Albert Museum, accompanied by Pippa of Sweet Clement Yarns and Ruth aka Rock and Purl. For those of you who don't know this designer, over his 30 year career he has really pushed boundaries and challenged preconceptions of traditional silhouettes, and was a key inspiration to much modern deconstructivist fashion. One of my favourite things about him is the subtle integration of traditional japanese dress into beautiful modern garments. Specifically, in the construction of Kōhō, I was inspired by his use of back detailing, layered armhole edgings and texture combinations. Additionally, and with help from my boyfriend Andrew (who knows about these things) I was able to develop a pattern piece that could be transformed into a unusual knitted garment. Kōhō begins with a wide knitted hem, that uses a simple 7 stitch twisted rib pattern and which is shaped between hip and waist. The strap is then bound off and the right front and back are worked as a single piece to the armhole. The back is then worked and the knit is continued in one piece over the shoulder and down to form the left front. As such, the knit is worked both bottom up and top down. The next stage is finish the right front. This is knit up and over the shoulder and finished with a decorative shoulder detail. The piece is finished with two sewn in edgings, which provide a subtle double layered effect around the armholes. There is one side seam to sew, and in order to achieve symmetry pseudoseams are used on both sides. This enables the real seam to be hidden inside a purl ridge, so even those with less than perfect mattress stitching skills can achieve a professional looking finish. Kōhō is a new twist on traditional garment construction and provides a challenge for experienced garment knitters wanting something different. That being said, in terms of stitches and techniques used, this knit should not be beyond the ambitious intermediate knitter. The garment uses twisted stitches, extensive shaping, grafting and requires a degree of sewing skill in setting in the edgings. Kōhō is knit using Sweet Clement Beloved yarn and requires between 3 and 4 skeins depending on the size knitted (pattern is provided as 30"- 44" in 2" increments). It is a great pattern for semi-solid yarns due to the regularly changing stitch count reducing any pooling that may occur. Kōhō is a lightweight summer vest inspired by the twists and turns found in modern Japanese fashion. Using a unique one piece construction including knitting both bottom up and top down (indeed, Kōhō is Japanese for “backwards”) this knit will have you thinking about the way you knit garments in a whole new way. It is available for £6.00 and you can buy now. I mentioned briefly yesterday that I was fortunate enough to be able to sell patterns at Knit Nation this year at the Sweet Clement Yarns stand. If you were at Knit Nation you may well have seen the samples, I do hope you liked them! The patterns were released exclusively at Knit Nation but I can announce that they are now available for download via Ravelry, and due to the genius of Ravelry even non-members can now use the site to make their pattern purchases. Firstly there is a pair of patterns based around falling leaves in mid-flight - the Tumbledown Set. The first is a wristies pattern, first seen at the UCL MODO show back in March, but reworked in Sweet Clement Besotted lace yarn. 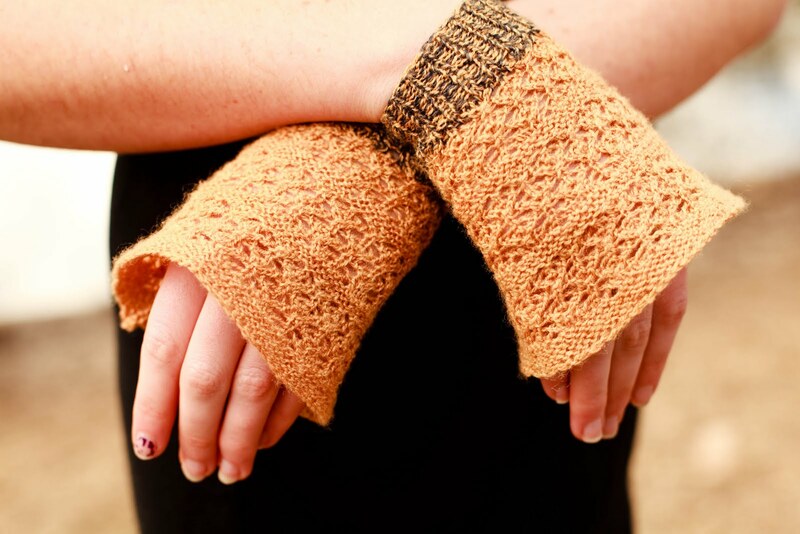 The wristies are perhaps unsurprisingly a quick knit, and a pair can easily be made over a weekend. They make great gifts, and the simple lace insertions add a layer of elegance and a great way to practice lace knitting skills. They are great for travel knitting, and have a very effective stretchy rib cuff, providing the wearer with confidence that they will not be lost. As a bonus, the pattern has instructions for knitting the wristies both flat and in the round, allowing you to choose based on your skill level or personal preference. Since making the first pair in March I've been wearing the first pair rather a lot, they are a fantastic finish to a great winter coat, or spice up a simple summer outfit. This pattern is available for £2.50 and you can buy now. The second pattern is the Tumbledown Scarf. This pattern was specially developed to compliment the wristies and the two patterns share many features. The inspiration for these patterns was that of leaves falling from trees at the end of autumn, and I feel that the modular nature of this scarf does a pretty good job of representing that. Again the scarf is knit using Sweet Clement Besotted, a laceweight yarn, and like the wristies, uses a simple 8 row lace repeat that is fantastic for improving lace knitters, or those looking for a pattern great for traveling or social knitting. The scarf is cresent shaped, forming a full half-circle when complete, and as such forms a very comfortable curve around the back neck. This is a scarf that wants to stay wrapped around you! The pattern is great for topping up your winter wardrobe, but is also delicate enough to be worn as an accessory in itself. The pattern is available for £2.50 and you can buy now. As a special treat, I am offering the Tumbledown set for the discounted price of £4, saving 20%, when both patterns are purchased. Simply add both patterns to your cart and the discount will be automatically applied. As part of this new foray into the world of London Knitting I was able to forge the close friendship with Alice, aka Socktopus, who I have mentioned on this blog before. As half of the Knit Nation team, I was able to persuade her to let me get elbows deep in Knit Nation organising, and as such ended up as Crew Coordinator. If you attended Knit Nation you probably would have seen me running around making sure everything was going smoothly! As a consequence of all this running around I didn't get a chance to take a single photograph over the 3 days of the event, and as such won't discuss it too much further, except to say a super duper thank you to all of the crew for making my job super easy, thanks to the vendors for being really lovely, thanks to the visitors for really getting into the spirit of the event, and making my life really easy, and super thanks to Alice and Cookie for letting me be involved. There have been a few really good posts gone up about the event, I'd strongly recommend In The Making's report on being a Crew Member, Knitspot's review of being a Teacher, and VisaLisa's photogallery. Additional and super duper thanks go to Pippa of Sweet Clement and Emms and Lou of Loumms who allowed me to sell 3 new pattern designs through their stall (and did all of the hard work of actually "selling" them for me). This was really generous, and really awesome. Thanks guys! The list of people I was able to chat to is almost endless, if someone was at Knit Nation, we almost certainly crossed paths. Of the teachers, the only 2 I missed were Susan Crawford and Julie Weisenberger (Cocoknits), which was a shame as I find her patterns really inspiring. Highlights included Judith MacKenzie complimenting my spinning, Anne Hanson giving me her phone number, Juliet Bernard (editor of The Knitter) saying she couldn't wait to hear from me regarding submissions, and Jon Dunn-Ballam (of EasyKnits) agreeing to come to our Knit Night. I could go on, but you'd think me a terrible bore! And never thought much about it except "blimey, that's massive, imagine the picnic you could have on that!" But with Judith's guidance we learnt about how the fibres were extracted, how it was woven and the knots tied, how it would wear (did you know a good wool carpet takes 20 years to reach it's peak condition? Walking on it slowly shears off some of the wool scales giving it greater lustre. In some Muslim countries babies were given carpets, so that by the time they were old enough to marry it was of the highest quality) and how the museums had restored it. After the tour we went for tea. We had tea (duh), sandwiches, cake and scones, and a glass of bubbly. Twas awesome. In this terrible picture you can see Steven West, Marjan Hammink (Yarnissima) and Judith MacKenzie, but I was also sat with Merike Saarniit, Ysolda Teague, Elise Duvekot and Alice. (Non-knitters note: This is awesome). So yes, all in all, twas a fantastic weekend and I am a very lucky girl!